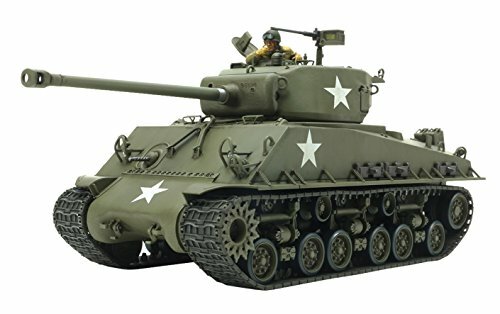 DESCRIPTIONSPECIFICATIONSGALLERYREQUIRED ITEMS This is an all-new kit designed by Tamiya’s top designers which recreates the “Easy Eight” variant of the legendary Sherman medium tank. The M4A3E8 was known fondly as the “Easy Eight” by its crews, thanks to the relatively smooth drive afforded by its Horizontal Volute Spring Suspension (HVSS). Another distinguishing feature was its 76mm gun. Some of the 2,500 examples produced were in time to appear in the Battle of the Bulge (Dec. 1944-Jan. 1945), and others even served in the Korean War years after the Allied WWII triumph. Movie buffs will no doubt also recall that the “Easy Eight” was the star of the 2014 hit film “Fury.”Slide molded turret and upper hull parts give an unbeatable combination of hassle-free assembly and highly realistic detail levels. Cast metal turret and welded hull surface textures are rendered accurately.